Y'all know I love digging in the dirt and that I have spent a lot of time and effort in my yard. Even though our lot is almost an acre, there isn't much of it that's in the sun for at least 6 hours a day since we have a wooded lot. I've always wanted to have a vegetable and herb garden, but since we didn't have much space, I just kind of gave that thought up...until now. So, this weekend, we decided to get rid of these huge loropetalum bushes, which take a whole bunch of trimming at least two times a year, to make space for a vegetable garden. You can see that we never got to trimming the tops of them last fall. This part of the yard is the most area in the backyard that receives enough sun for a vegetable garden. Unfortunately, this area is on a hill since we have a basement. Taking the bushes out was pretty easy and took less than 30 minutes! Mr. Fanatic still has to build the side returns for the "boxes" and we need to fill them up with about 3 yards of dirt. Each of the 4 raised beds is 4ft wide by 10 feet in length. I am also going to stain the wood so they are a little darker. It was a lot of work to get this far! Hopefully we can finish up soon because Spring is almost here. It was 81 degrees today! I am so envious that you are already gardening!! Your beds look fantastic! You really had a great idea doing the raised bed staggered like they are. I wish you much luck growing your veggies this year!! Your planter boxes look like they will produce many tasty veggies.. I'm envious.. there is no way I can grow such in my yard. Although I have a large yard it is filled with critters that would have breakfast, lunch and dinner! I keep herbs in pots and planters on the deck and up balcony and they have chicken wire on them.. I am so jealous! I live in a condo, but as soon as I move into a home that is one of my first things to do. I'm ready for spring too! I know you'll enjoy your vegetable garden. Look forward to seeing it grow. Dropping by from Met Monday, with a post on repurposed shelving. Pam, this is going to be fantastic - I know you'll love stepping out of your home and picking fresh veggies! Oh, I wish I could get in the dirt already! It will be muddy here till May. looking fantastic! 81...my goodness!! You will love your garden boxes. I have switched to boxes and love it. We have critters here, and they were a real problem tunneling underground to my veggies!!! Can't wait to see your progress! Wow, 81!!! It was pretty warm here too. I love that kind of garden! My mom gardens but like her brother who has a big farm, and it's grueling, lol!! I'm thinking I need to learn this year and help her out. She is already planning thinking she will be better than ever! Your garden is going to be gorgeous! I can't wait to see it. It was 85 here yesterday & it was AWESOME!!! I can't wait for everything in the yard to get green & start blooming. Congrats on your 1 yr. anniversary! The planters are a great idea. I have wanted some for a couple of yrs. now. No luck yet, but I just showed hubby yours. I know you're going to love those fresh veggies. I have always wanted to do this. What a perfect spot Pam..can't wait to see the progress. 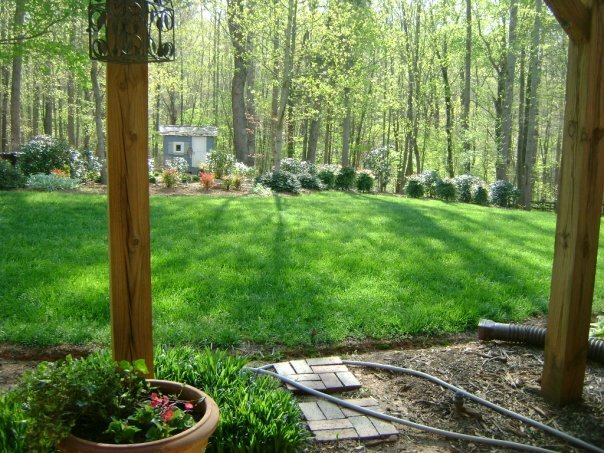 You have a gorgeous yard! What a great idea to put your garden there. I'm here from BNOTP and am your newest follower. I'd love it if you got a chance to drop by my new blog. First off, I am so happy to hear your interest in my post. I will have to look into the book your suggested and will keep you in mind for future consultations. LOL-seriously! I really would so love to have a garden again. It's been sometime since I've had one. I haven't attempted to have one in this house because of the clay. This would work really well in our yard because we are sloped too and I could fill it up with good dirt. I cannot wait to see your pretty garden this spring and summer! I can't wait to set out our garden! !